In February, March, and April of this year, nine million jobs opened up. That’s three million jobs a month consistently for those consecutive months. The most evasive jobs were government jobs. Few people seem to be leaving these coveted jobs, and few new positions are being created. In government the job openings rate was 1.4 percent in April. Despite devastating cuts in school budgets, the job openings rate was 2.7 percent in education and health services. 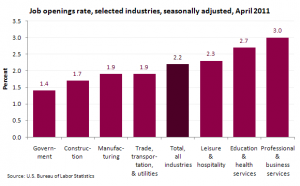 The biggest increase in jobs was seen in professional and business services. The average jobs opening rate in April was 2.2 percent. As a recruiter, does this seem consistent with what you’ve observed? Do you think the openings were the types of jobs that are notoriously difficult to fill? Or do you think that the jobs that are opening up in the United States are jobs that are difficult to fill?